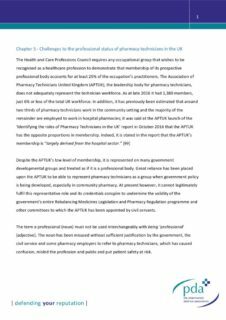 Can the APTUK claim to be a representative body for pharmacy technicians? The Health and Care Professions Council requires any occupational group that wishes to be recognised as a healthcare profession to demonstrate that membership of its prospective professional body accounts for at least 25% of the occupation’s practitioners. Despite being established in 1952, by late 2016 APTUK stated it had just 1,380 members in the UK. This would represent just 6% of the total workforce in Great Britain of 23,150, less if Northern Ireland members are taken out of the equation. Two thirds of pharmacy technicians work in the community pharmacy setting and most of the remainder in hospital pharmacies. In October 2016, the APTUK launch its report entitled ‘Identifying the roles of pharmacy technicians in the UK’ which indicated that the APTUK’s membership is “largely derived from the hospital sector.” In November 2017, of the 14 APTUK executive officers reportedly in post, just one of the officers worked in community pharmacy and this on a part-time basis. The sectoral focus on hospital pharmacy, the low membership numbers and the resulting financial constraints this places upon the organisation drastically limit the APTUK’s capability to represent pharmacy technicians. It does not satisfy the healthcare profession criteria described by the Health Professions Council. The president of the APTUK, Tess Fenn, recently told the PDA: “I am a grand parented Pharmacy Technician with, at the time of entry onto the GPhC register (2011) 41 years’ experience ranging from hospital, community, primary care and academia. I also have a number of pharmacy accreditations in accuracy checking & medicines management, leadership and management qualifications as well as a degree in my specialist area. I have trained and mentored countless pre-registration pharmacists and have supported many pharmacists in their early years, particularly in exercising their professional judgment. APTUK committee members are invited to sit on many important government developmental groups. Only mid-senior or senior pharmacy technicians are members of the APTUK executive and Ms Fenn’s biography illustrates a concern. The APTUK president and pharmacy technicians with “masters degrees and a myriad of post-registration qualifications” are not representative of the vast majority of pharmacy technicians and in particular those from the community pharmacy sector, who rarely meet anywhere near these levels of qualification or experience. Despite the APTUK’s low level of membership, its sectoral focus and its very limited resources this, great reliance has been placed upon the APTUK by the Department of Health’s Rebalancing Medicines Legislation and Pharmacy Regulation programme board (Rebalancing board) to be able to represent pharmacy technicians as a group when government policy on supervision is being developed for community pharmacy. The APTUK is being treated as if it is a professional body. Yet it is the community pharmacy technicians that work alongside community pharmacists every day who will be impacted by any proposals on supervision that are currently being considered by the Rebalancing board. Professional interests are borne out of a collective ambition and they lead to the creation of a strong representative voice. If there is no strong representative voice, then arguably, the collective ambition may not exist. 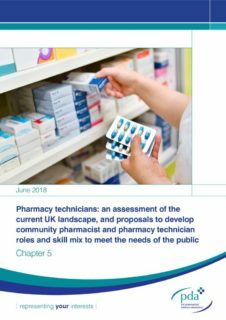 Undoubtedly pharmacy technicians should organise themselves into a body, such as the APTUK, and press for developmental progress; encouraging standards and provide learning for their members. The APTUK however, cannot currently be described as meeting the definition of a professional body even if that is how it chooses to describe itself or how the government, keen to pursue its skill mix agenda would prefer it to be. It cannot legitimately fulfil a representative role and its credentials conspire to undermine the validity of the government’s entire Rebalancing Medicines Legislation and Pharmacy Regulation programme and other committees to which the APTUK has been appointed by civil servants. The Department of Health announced proposals in 2006 which, if enacted, would lead to pharmacists supervising pharmacies remotely and the delegation of certain tasks to pharmacy technicians. It could be perceived that it has been pursuing this agenda intermittently since that time, with varying degrees of effort – for example by introducing the Responsible Pharmacist regulations in 2009. The reports of the Francis inquiries into the failures at the Mid Staffordshire NHS Foundation Trust, published in 2010 and 2013, recommended that there be senior clinical involvement in all policy decisions affecting patient safety and wellbeing and consultation with professional staff affected by the proposed changes. Despite this, the Department of Health’s Rebalancing board has secretly developed proposals through its supervision sub-committee to allow pharmacy technicians to supervise the sale and supply of prescription only and pharmacy only medicines and pharmacy staff, in the presence or absence of a pharmacist. The supervision short life working group that generated this proposal was made up of two of the UK Chief Pharmaceutical Officers, the RPS President, the Manager of Pharmacy Forum NI, a senior representative of the PSNI, a senior representative of (the now disbanded) Pharmacy Voice, a senior representative of GPHC and the President of the APTUK. It has done this without consulting widely with pharmacists or pharmacy technicians at the coalface. Since the proposals were leaked to the Chemist and Druggist in September 2017, there has been significant opposition and bewilderment from within the profession as well as from overseas organisations including the PGEU and the Commonwealth Pharmacists’ Association. The government’s approach to the enforced delegation of tasks from pharmacists to pharmacy technicians has created considerable anxiety among pharmacists especially in the community pharmacy setting, and there is a lack of confidence among many pharmacists in relation to pharmacy technicians’ capabilities in that sector. This can be seen at present where pharmacists are required by their employers to delegate the final accuracy checking of dispensed prescriptions to Accuracy Checking Technicians (ACTs), who may or may not be registered pharmacy technicians. There is no legal or regulatory control over who may call himself or herself an ACT or around the qualifications required to become an ACT, but it is clear that the pharmacist retains overall responsibility. A study conducted by JRA Research on behalf of the PDA found that half of community pharmacy technicians required assurances that it would be the pharmacist, not the pharmacy technician, that would be held responsible and liable in the event of a dispensing error. The development of increased responsibilities for the pharmacy technician’s role cannot proceed in circumstances where the group is not ready to accept accountability for such.